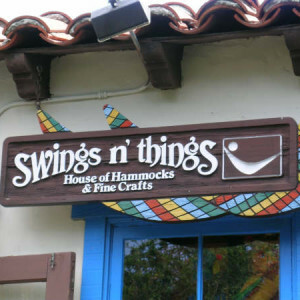 Swings and Things is your online store for hammocks, hammock chairs, hanging loungers, porch swings, hammock stands and accessories, and garden art from around the world. 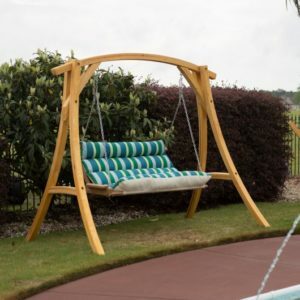 See our large selection of high quality and unusual items, all of which can be shipped direct to you anywhere in the USA. We can ship most items direct to you for only $15.00 anywhere in the USA! Additional items are only $4.00 shipping & handling each. International customers: we ship anywhere in the world! Order by phone and you still get our online prices and low shipping costs! Call us toll free: 877 234 8229. 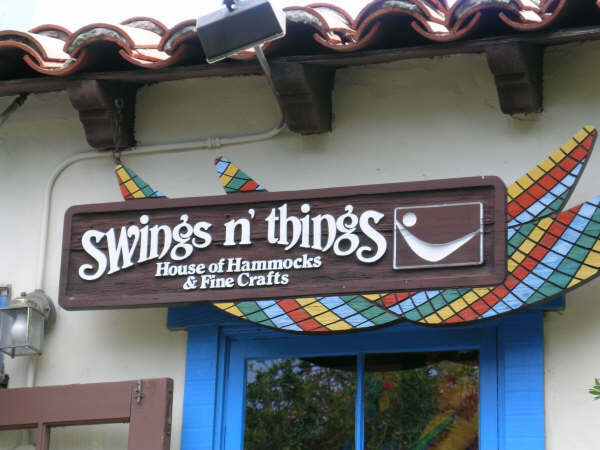 Or call Swings and Things expert staff direct at (619) 234 8995 during business hours. 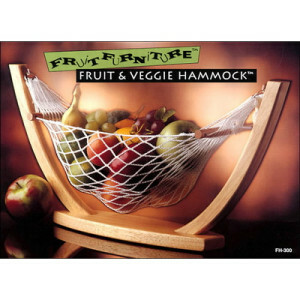 This premium-quality hammock has a unique weave design and offers unsurpassed comfort. It is extra-large, and its organic cotton is wonderfully soft to the touch. The traditional hand-plaiting of the cords is one of its special quality features. 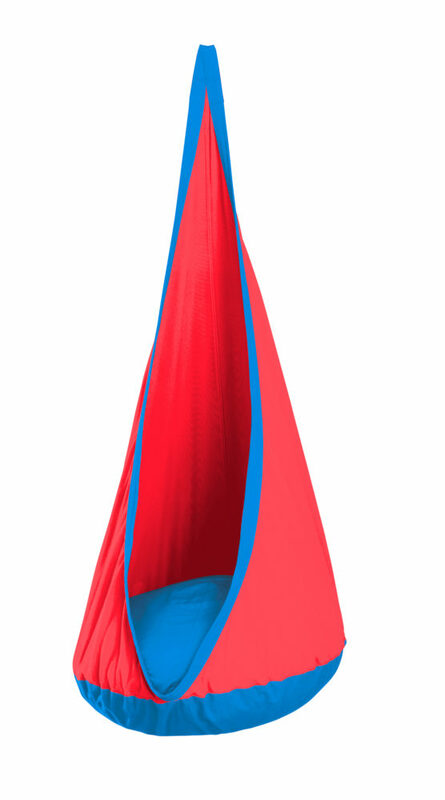 The large number of suspension cords ensures optimal weight distribution, incredible comfort, as well as durability. Reinforced edges make the material extremely tear-resistant. 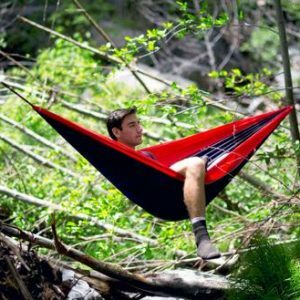 In the AVENTURA forest weatherproof double hammock, you can relax and watch the breeze rustle through the treetops. 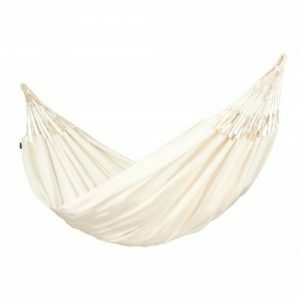 Weatherproof double hammock AVENTURA wild rose is perfect for sweet dreams outdoors. 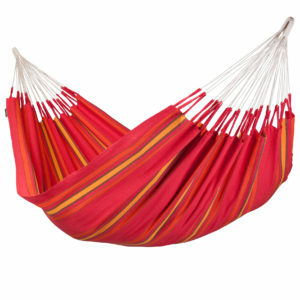 Double hammock CURRAMBERA cherry in a traditional bright mix of stripes. 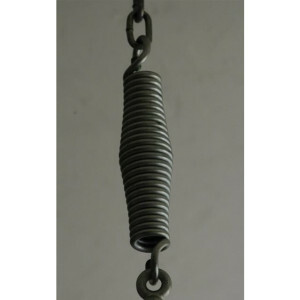 Suspension set for flexible installation on walls, ceilings, beams or between trees. 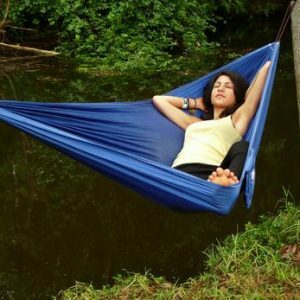 Hammocks are easy to suspend or remove using the UNIVERSAL ROPE. 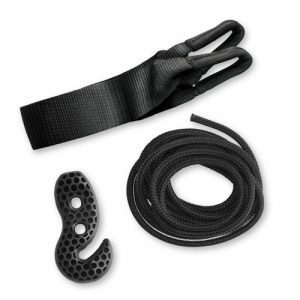 The SmartHooks allows easy adjustment of rope length. 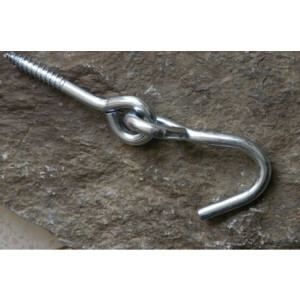 The hooks can be installed using everyday tools and are suitable for attachment to various surfaces. 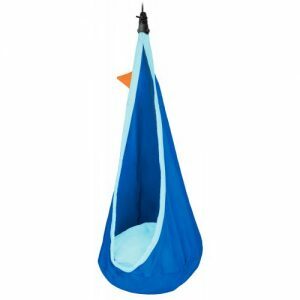 Its triangular shape with 3 holes ensures optimal weight distribution. 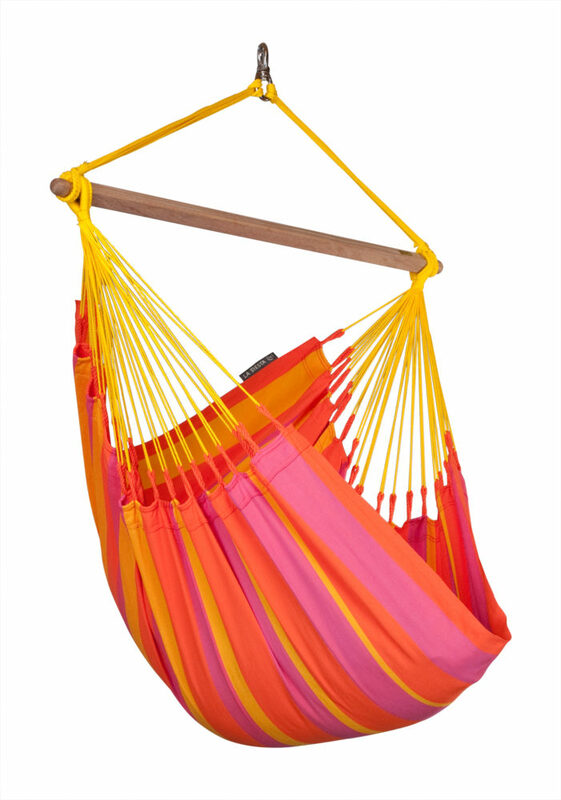 An especially large and stable hammock chair stand made of powder-coated steel. 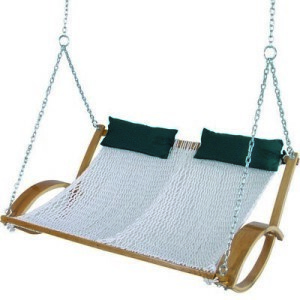 The seat height can be adjusted as needed with an integrated rope. 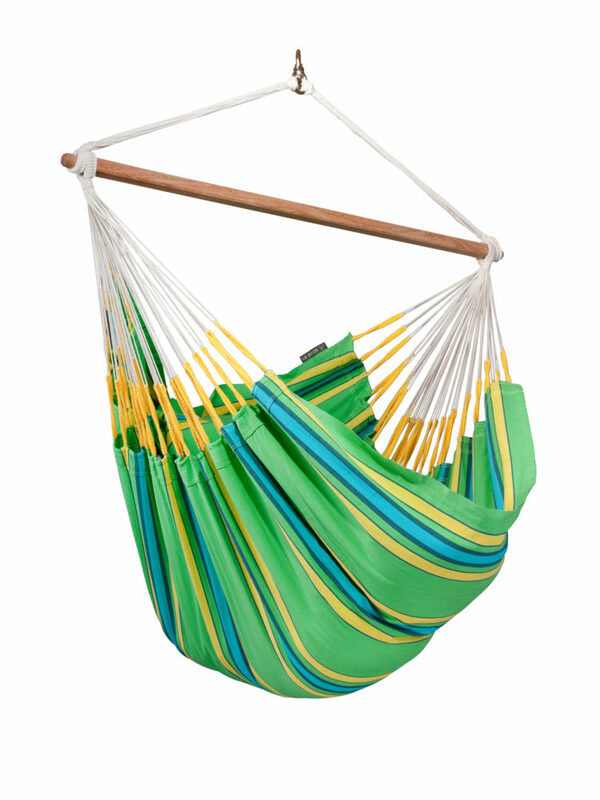 Large enough for optimal freedom of movement, even with a hammock chair lounger. 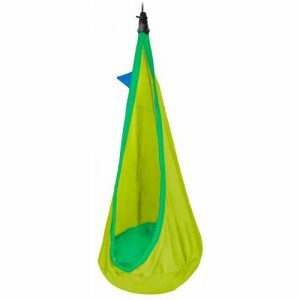 The children’s hanging nest JOKI PLANET turtle is made of super-soft organic cotton in soft pastel shades. 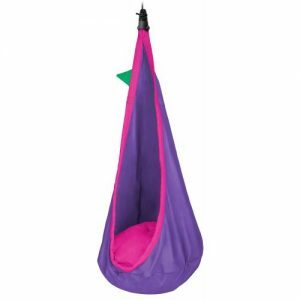 It hangs from the ceiling like a cocoon and comes with a large comfy cushion. It is a perfect place for dreaming, reading or playing. JOKI is suitable for children aged 3 - 9 years. A minimum height of 200 cm is recommended for the hanging nest. The product is certified by the German Technical Inspection Agency (TÜV) and bears the GS seal for “Tested Safety”. 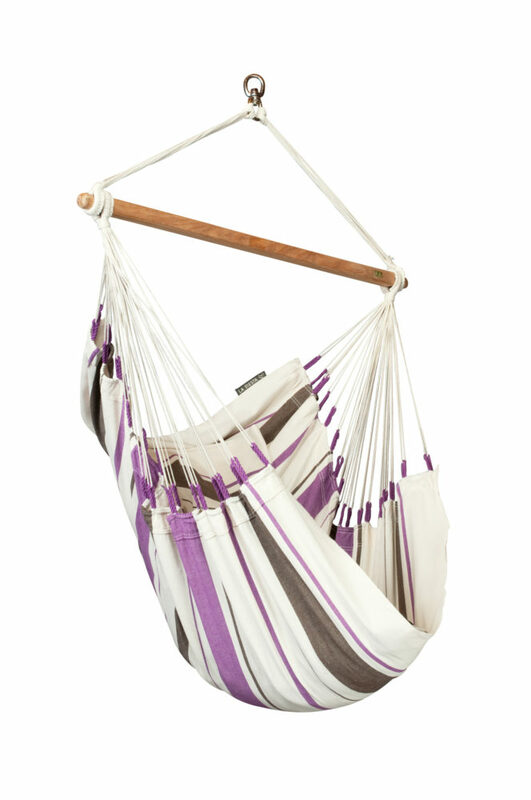 The luxurious family hammock BOSSANOVA in Bordeaux, made of organic cotton, is extra-large, soft and comfortable. Because of a special diagonal stretch weaving technique, the BOSSANOVA hugs your body’s contours perfectly. 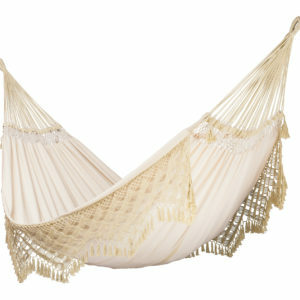 The decorative fringe and macramé trim are typical for Brazilian hammocks. 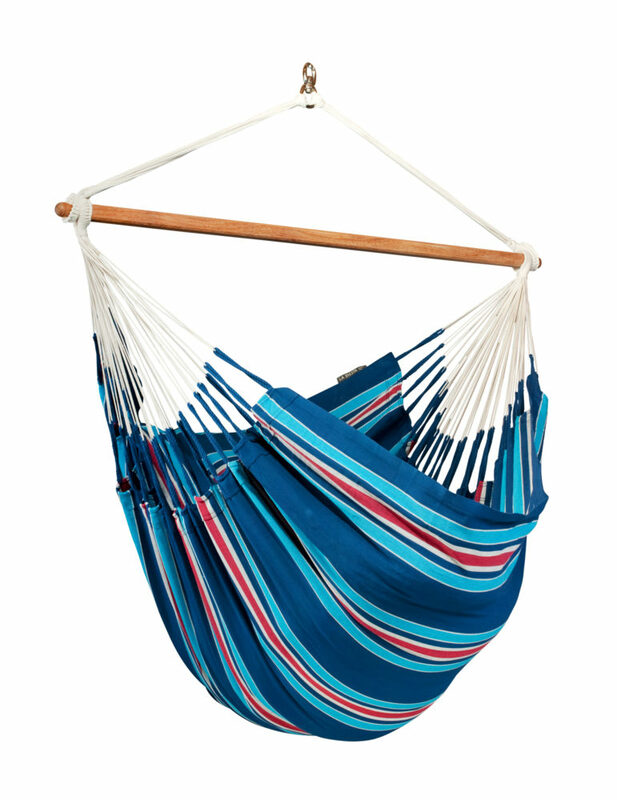 The large number of suspension cords ensures optimal weight distribution and excellent comfort. 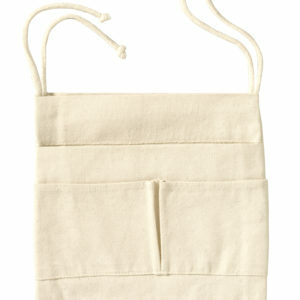 The organic cotton is soft to the touch and yet easy to clean. When you purchase a BOSSANOVA, you’re not only doing something good for yourself, but also for Brazilian street children! LA SIESTA supports the project “Dito Escolinha” in the Brazilian city of Fortaleza. For each BOSSANOVA sold, LA SIESTA donates 5€ to the German charity “Tor zur Hoffnung (Gateway to Hope) which provides Dito’s beach soccer academy with training equipment, learning aids and much more. 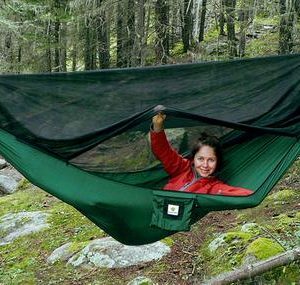 ALABAMA avocado is a comfortable weatherproof king-sized hammock. It is quilted and comes with a detachable pillow for ample relaxation in North American style. 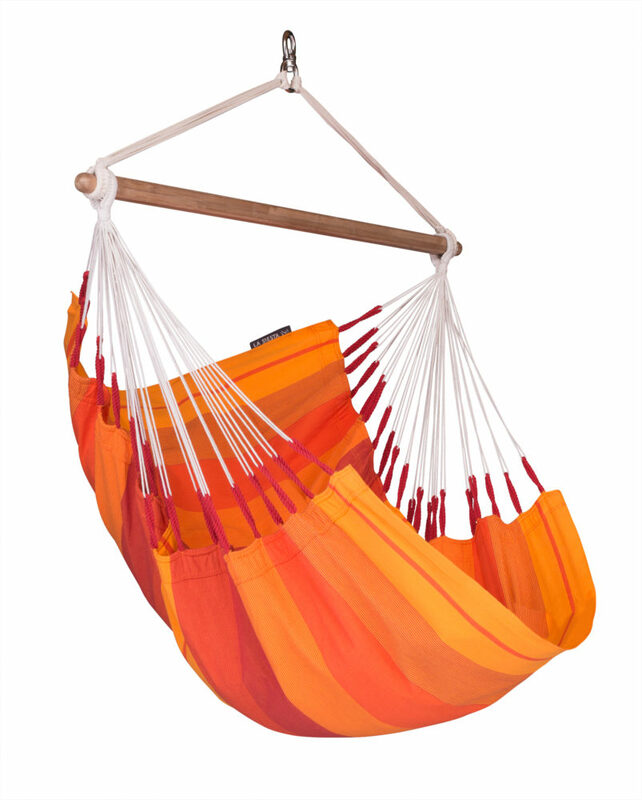 It is made of UV-resistant, fast-drying HamacTex®, which almost feels like cotton. 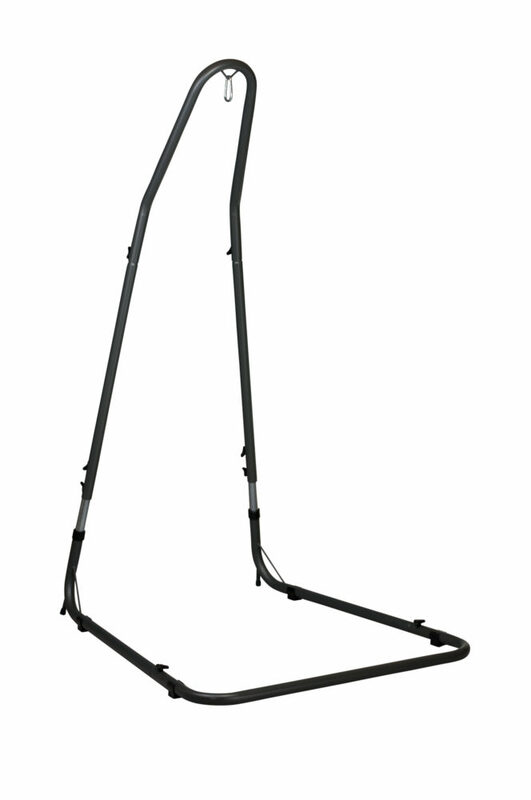 The spreader bars are made of wood from responsibly managed forests (FSC®). 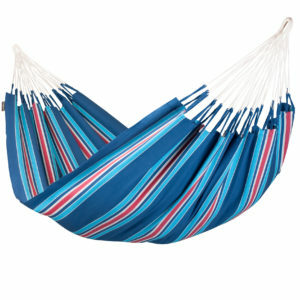 Double hammock CURRAMBERA kiwi in a traditional bright mix of stripes. 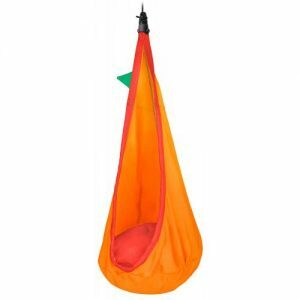 The weatherproof children’s hanging nest JOKI OUTDOOR spider hangs like a cocoon from a tree limb or beam and is a welcoming place for kids to play and dream. The HamacTex material is robust and withstands all kinds of weather. 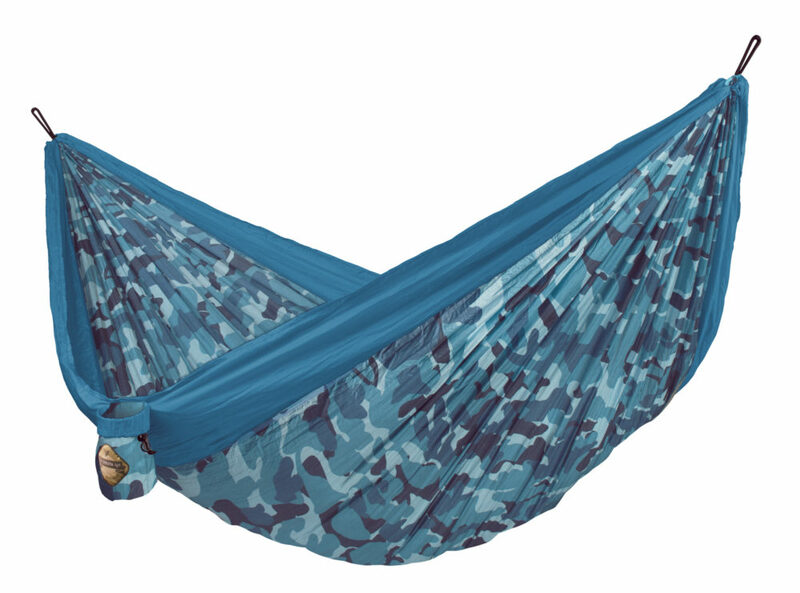 COLIBRI CAMO double travel hammock river is lightweight, made of soft, breathable parachute silk. 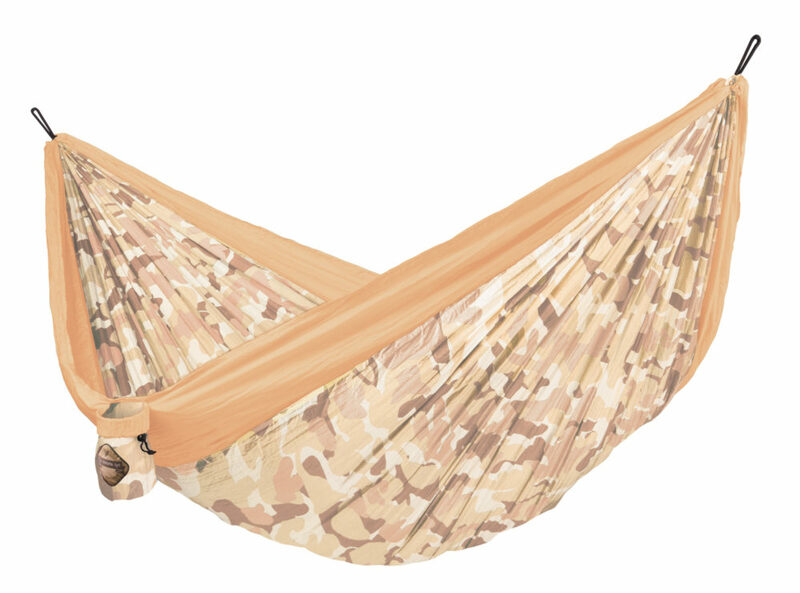 COLIBRI CAMO double travel hammock sahara is lightweight, made of soft, breathable parachute silk. 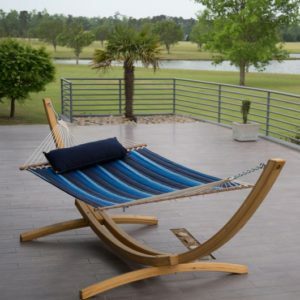 MESERO tray table is the accessory that makes relaxing in your hammock perfect- your drink, book, or other useful objects are always within easy reach. MESERO is weatherproof and is simply poked into the ground. A handy grip makes it easily transportable. 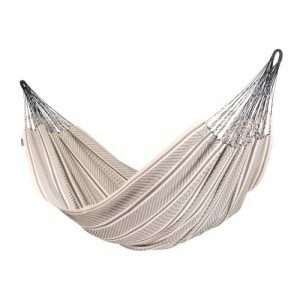 Its unique weave makes double hammock CAROLINA spring exceptionally robust, yet soft to the touch. Produced in Colombia from pure, high-quality cotton. A special feature is the traditional hand-plaited cords. 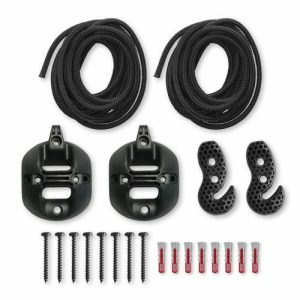 The large number of suspension cords ensures optimal weight distribution and incredible comfort, as well as durability. Reinforced edges make the material extremely tear-resistant. 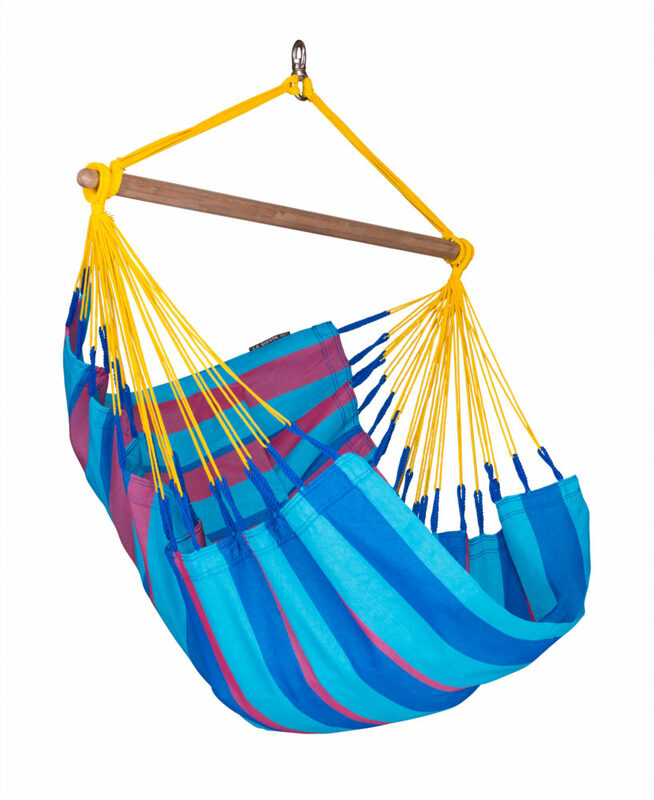 Extra-large family hammock FLORA curaçao, made of organic cotton and certified by GOTS. Reversible. 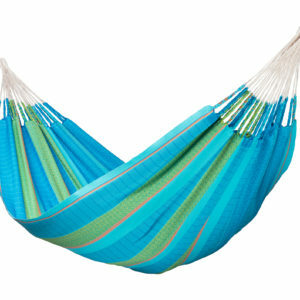 Available in Natural, Green, and Blue. 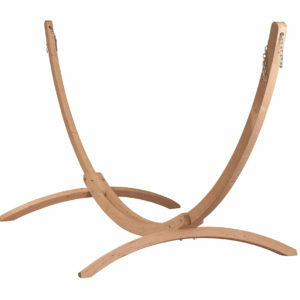 An extremely sturdy and weatherproof hammock stand made of FSC-certified wood for LA SIESTA Double hammocks. The Aventura Canyon model is enchanting with an elegant color interplay of natural earth tones. 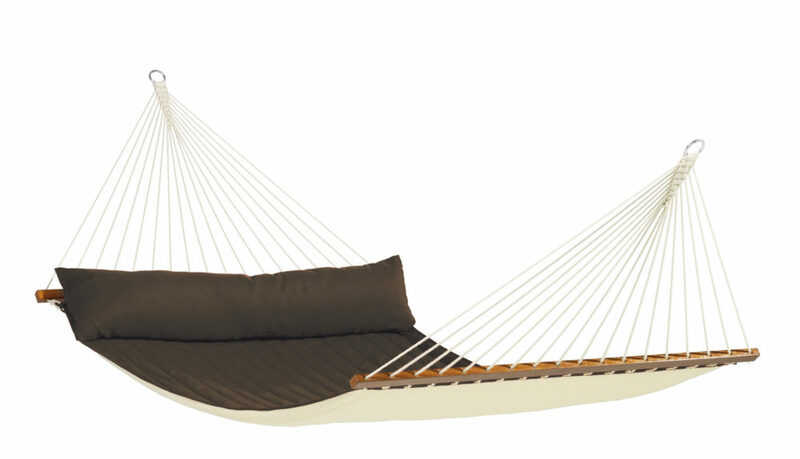 This down-to-earth design, with a warm harmony of natural earth tones, invites you to relax and dream the hours away. And there's room enough for two, for double the fun! 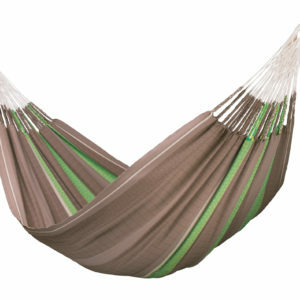 Our Aventura is manufactured in Colombia from Hamac-Tex®, a fast-drying and weatherproof fabric. 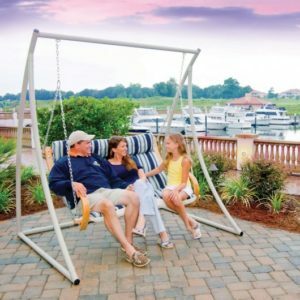 Like all Aventura models, the Aventura Canyon has a large number of suspension cords which provide optimal weight distribution and longevity, even outdoors. 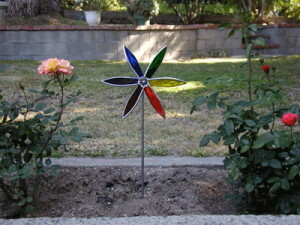 The reinforced edges are especially tear-resistant. 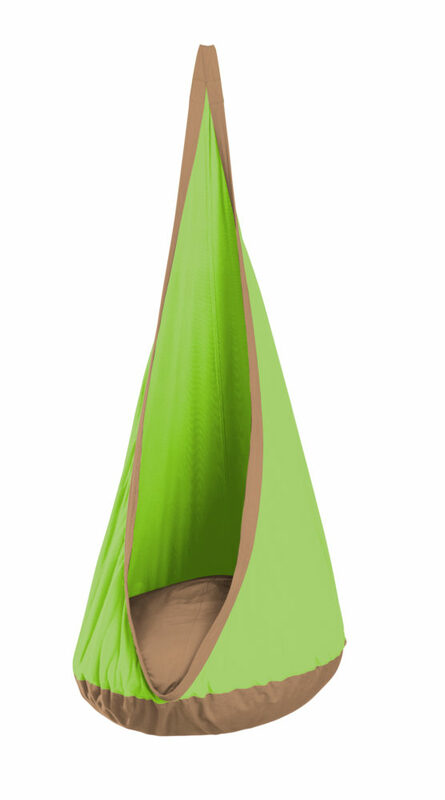 The ORQUIDEA is produced in Colombia from pure, high-quality cotton. Reinforced edges make the material extremely tear-proof. 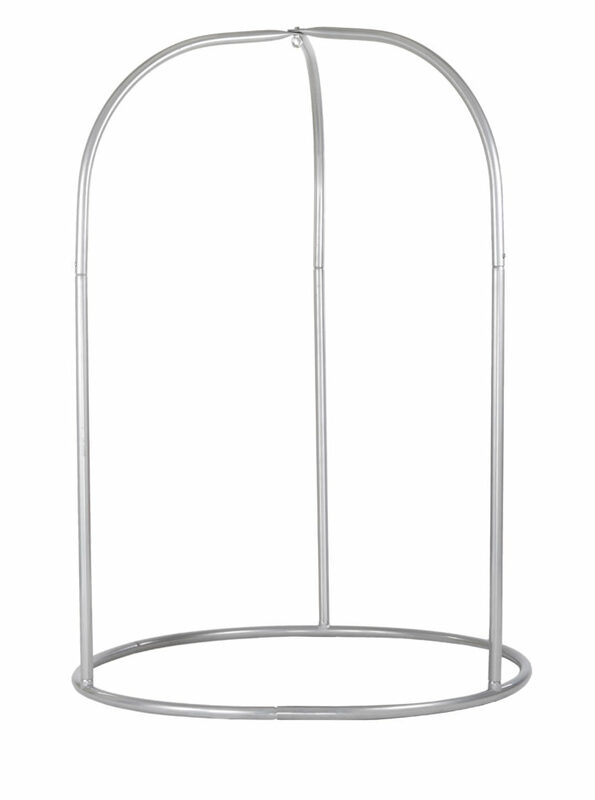 The large number of cords ensures optimal weight distribution, comfort and durability. 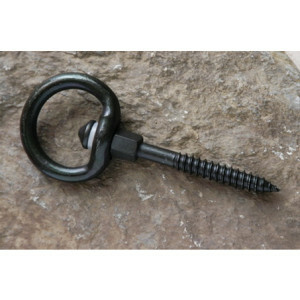 The integrated safety swivel guarantees safe 360° rotation. 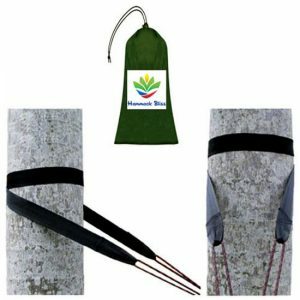 The spreader bar is made of top-grade bamboo which is not only an eye-catcher, but also sturdy and weatherproof. In addition, the wood originates from responsibly managed forests (FSC ®). 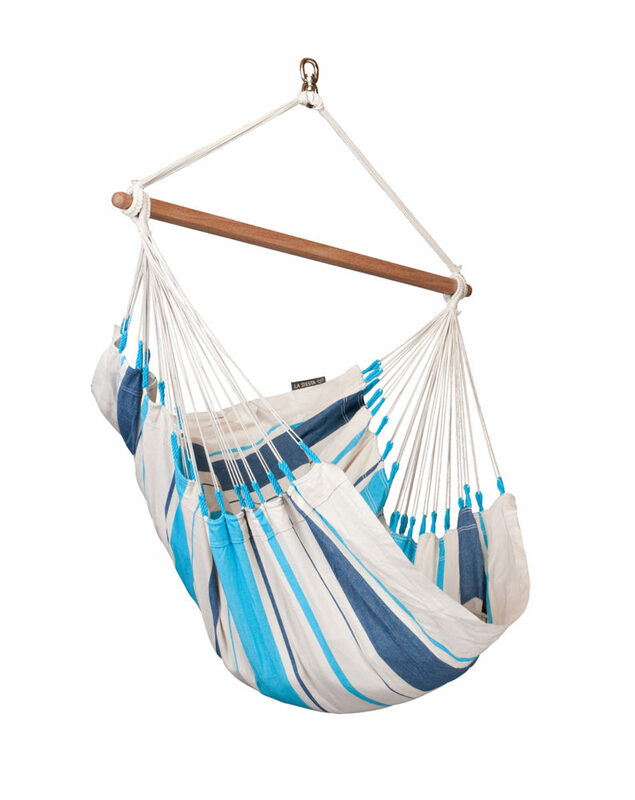 Basic hammock chair ORQUÍDEA lagoon – as fresh and blue as the sea: a cozy haven to relax in at home. 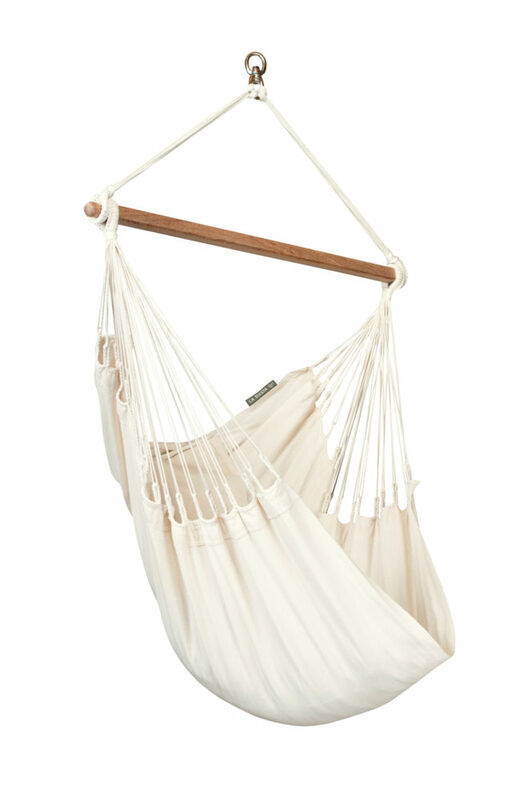 Extra-large family hammock FLORA blossom, made of organic cotton and certified by GOTS. 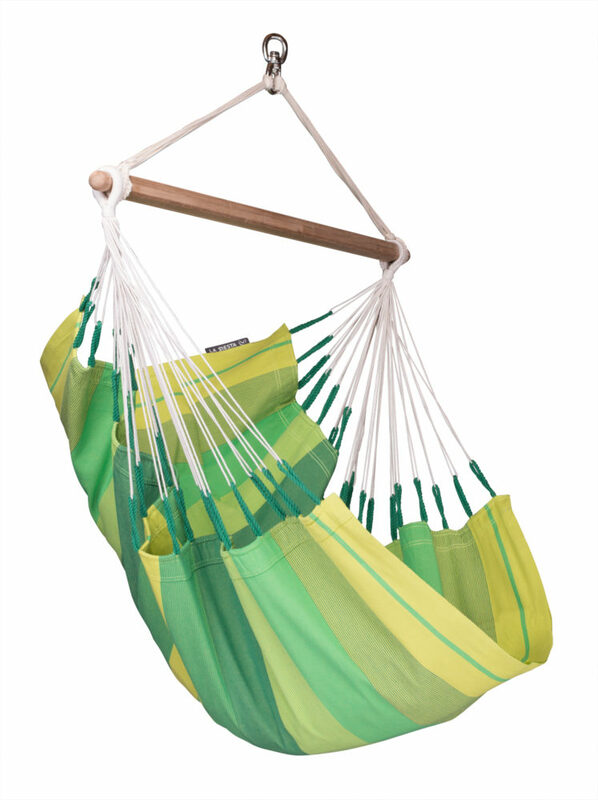 Basic hammock chair ORQUÍDEA jungle – in the lively green color of a summer meadow: a cozy haven to relax in at home. 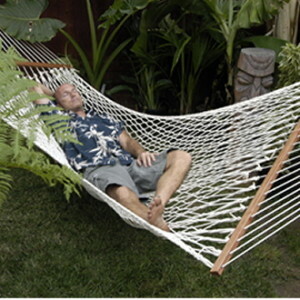 ALABAMA arabica is a comfortable weatherproof king-sized hammock. 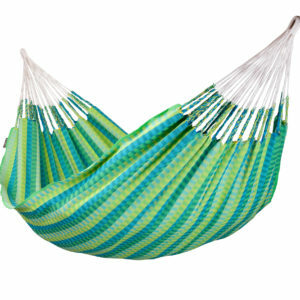 It is quilted and comes with a detachable pillow for roomy relaxation in North American style. 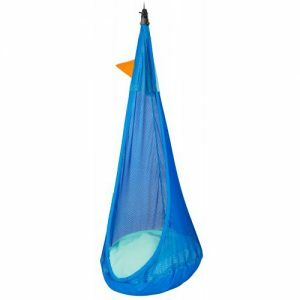 The weatherproof children’s hanging nest JOKI OUTDOOR nemo hangs like a cocoon from a tree limb or beam and is a welcoming place for kids to play and dream. The HamacTex material is robust and withstands all kinds of weather. Suspension set for suspension from a tree. This set is not just extremely practical, it’s also weatherproof. All parts are 100% "Made in Germany". This sturdy yet classy detachable side pocket is the perfect place to keep your glasses, reading materials or other things within easy reach. ÚTIL is made of organic cotton and is GOTS certified. 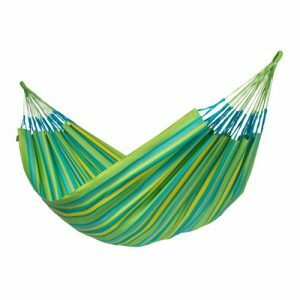 Weatherproof hammock chair basic SONRISA lime – LA SIESTA’s popular oasis for peace and quiet in a bright mix of summer stripes. 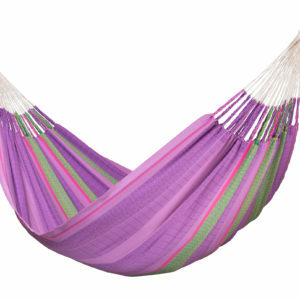 It is made in Colombia from weatherproof, fast-drying HamacTex®. Reinforced edges make the material extremely tear-resistant. The large number of cords ensures optimal weight distribution and incredible comfort, as well as durability. 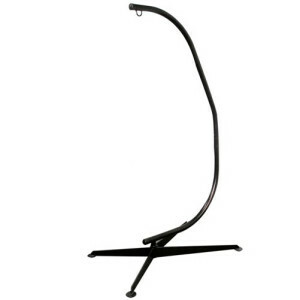 The integrated safety swivel guarantees safe 360° rotation. 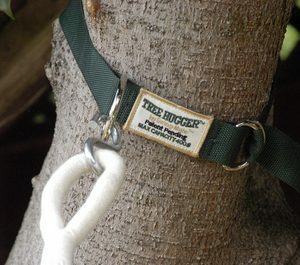 The spreader bar, made of top-grade bamboo, is not only an eye-catcher, but also extremely sturdy and weatherproof. 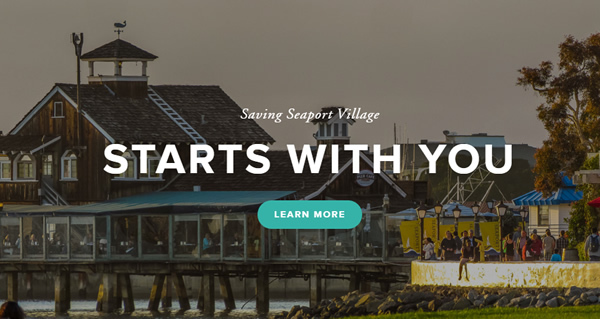 In addition, the wood comes from responsibly managed forests (FSC ®). 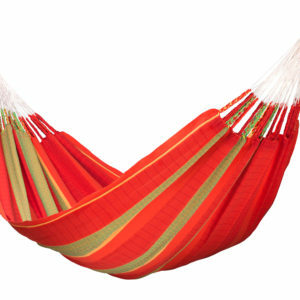 Extra-large family hammock FLORA chilli, made of organic cotton and certified by GOTS. 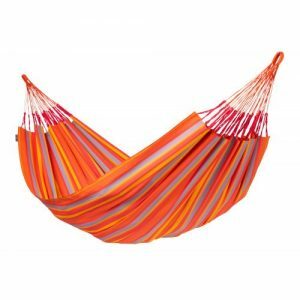 Weatherproof hammock chair basic SONRISA mandarine – LA SIESTA’s popular oasis for peace and quiet in a bright mix of summer stripes. 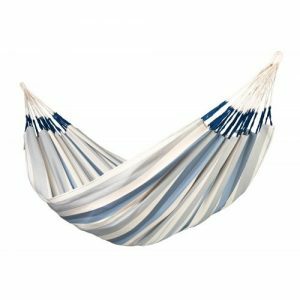 ALABAMA navy blue is a comfortable weatherproof king-sized hammock. It is quilted and comes with a detachable pillow for ample relaxation in North American style. 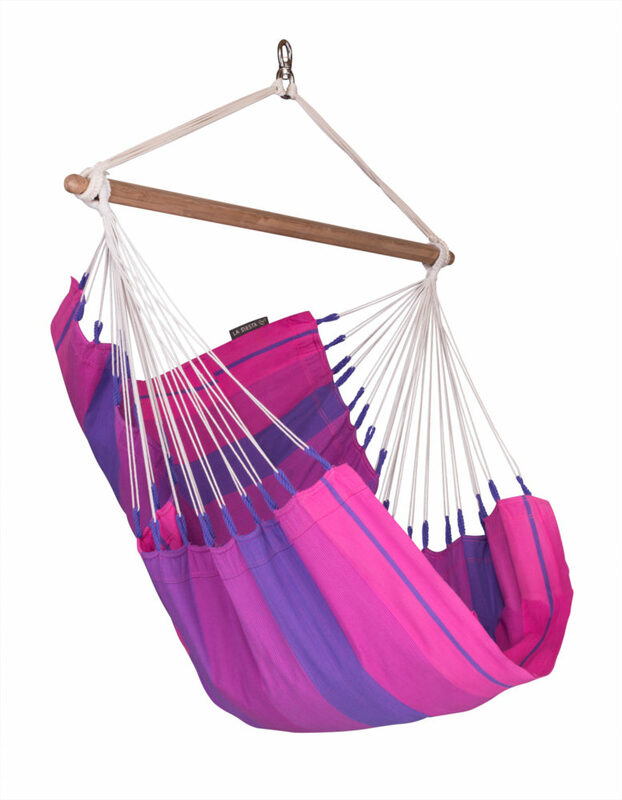 Basic hammock chair ORQUÍDEA purple – in trendy and dreamy shades of purple: a cozy haven to relax in at home. 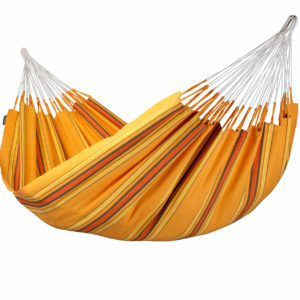 Double hammock CURRAMBERA apricot in a traditional bright mix of stripes. 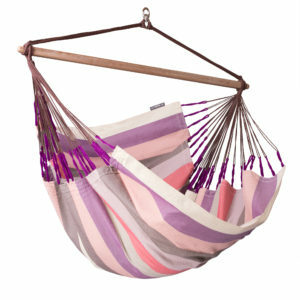 Hammock chair basic CARIBEÑA purple with fresh stripes offers a maximum in comfort in a minimum amount of space- a hint of the Caribbean in your home. Produced in Colombia from pure, high-quality cotton. Reinforced edges make the material extremely tear-resistant. The large number of cords ensures optimal weight distribution and incredible comfort, as well as durability. The integrated safety swivel guarantees safe 360° rotation. 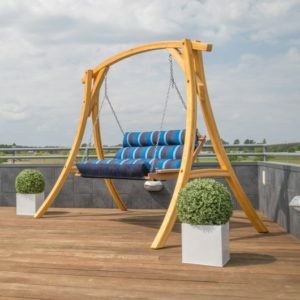 The spreader bar is made of top-grade bamboo and is not just a visual highlight, it is also particularly robust and weatherproof. 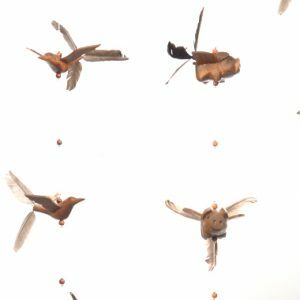 In addition, the wood comes from responsibly managed foresters (FSC ®). 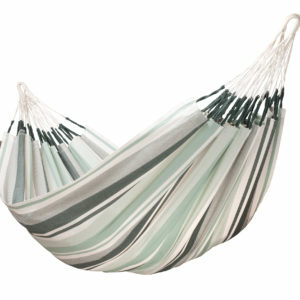 The double hammock PALOMA will attract you with its classic and elegant design and understated shades of blue and gray. 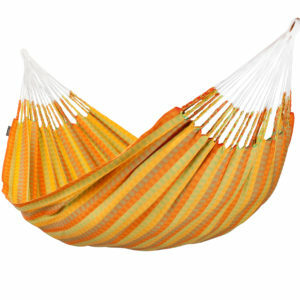 Its unique weave makes double hammock CAROLINA citrus exceptionally robust, yet soft to the touch. 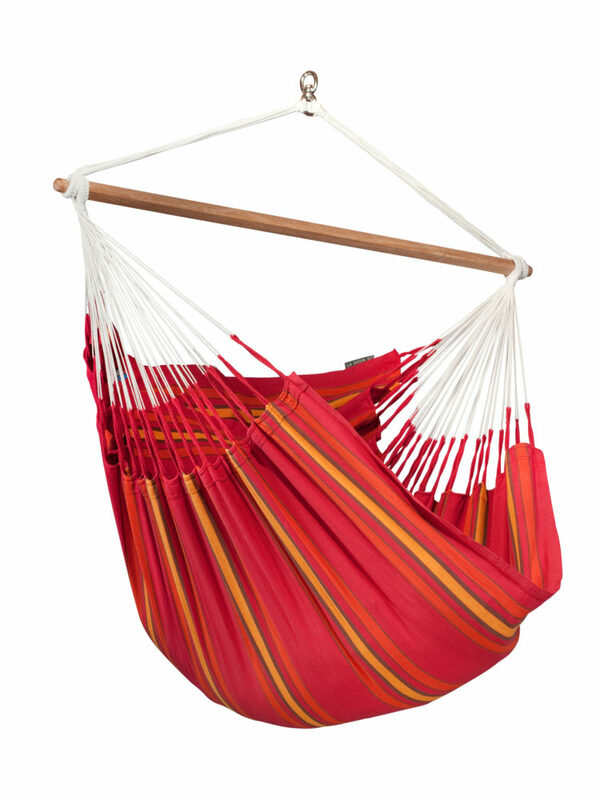 Weatherproof hammock chair lounger DOMINGO coral offers lots of room for carefree summer fun. 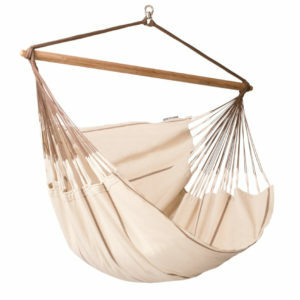 The luxurious family hammock BOSSANOVA in champagne, made of organic cotton, is extra-large, soft and comfortable. 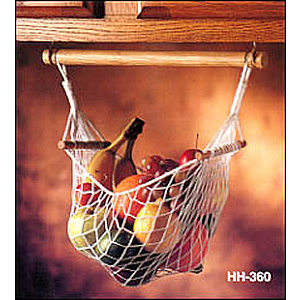 Great addition for your hanging chair. 300 lb. capacity. 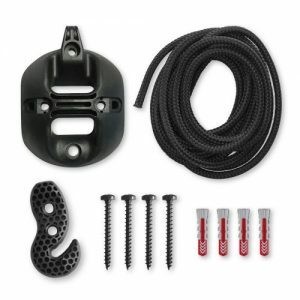 Price is for 1 hammock swivel screw. 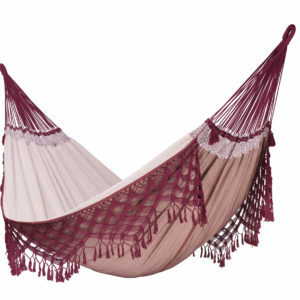 Its unique weave makes the double hammock CAROLINA flowers exceptionally robust, yet soft to the touch. 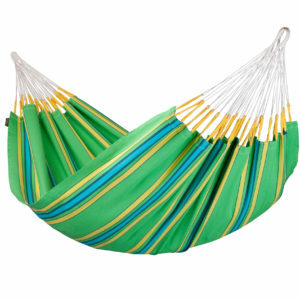 Available in natural, blue or green. Perfect place for a cold one! 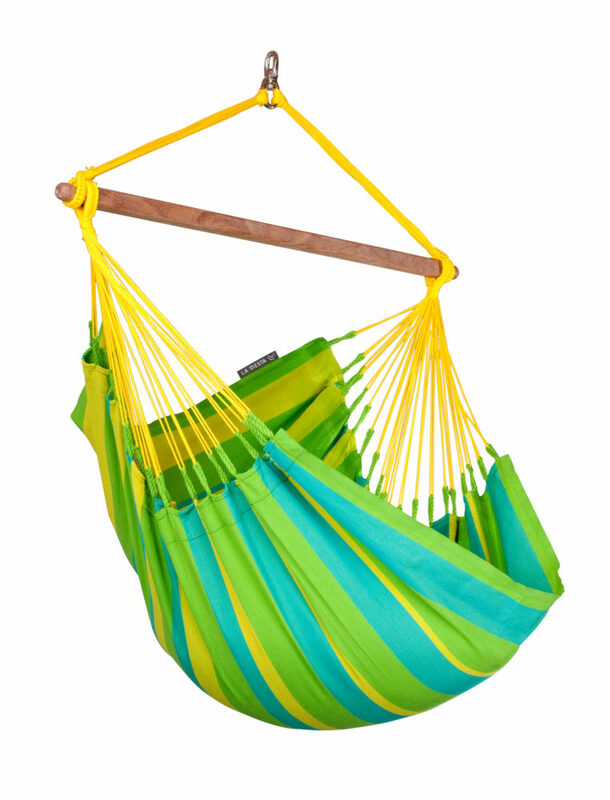 Easily attaches to top bar of hammock chair or side of hammock. 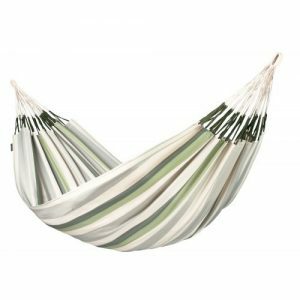 Weatherproof hammock chair basic SONRISA wild berry – LA SIESTA’s popular oasis for peace and quiet in a bright mix of summer stripes. 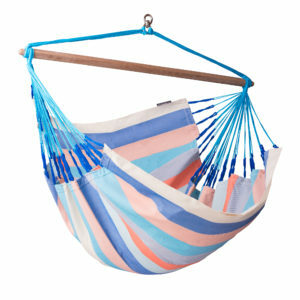 Hammock chair lounger CURRAMBERA apricot is made from pure cotton in a traditional, cheerful mix of stripes. It is extra-large, enabling you to not only sit comfortably in it, but also recline. 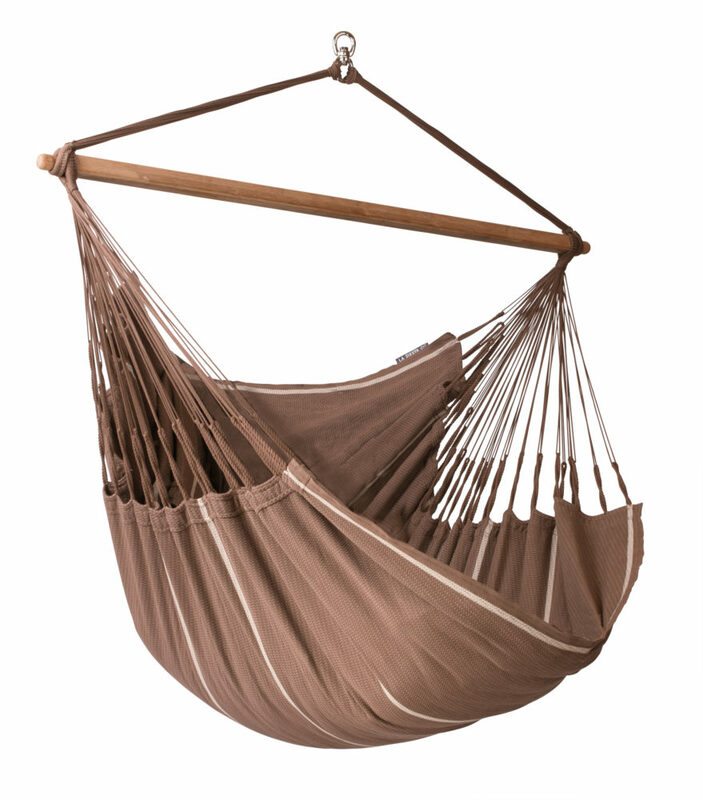 Enjoy pure relaxation in the basic hammock chair MODESTA arabica, made of coffee-colored organic cotton! 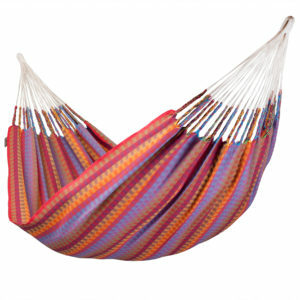 Hammock chair lounger CURRAMBERA cherry is made from pure cotton in a traditional, cheerful mix of stripes. It is extra-large, enabling you to not only sit comfortably in it, but also recline. 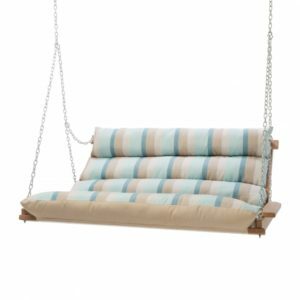 Hammock chair lounger CURRAMBERA kiwi is made from pure cotton in a traditional, cheerful mix of stripes. 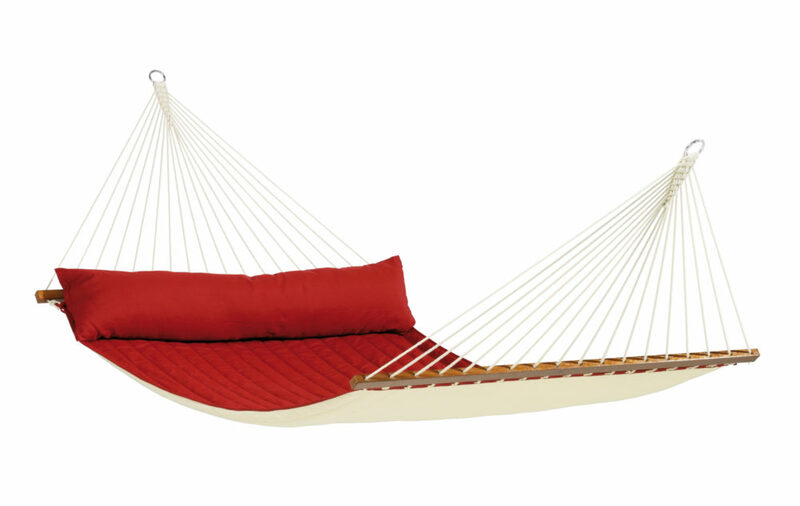 It is extra-large, enabling you to not only sit comfortably in it, but also recline. The children’s hanging nest JOKI PLANET koala is made of super-soft organic cotton in soft pastel shades. 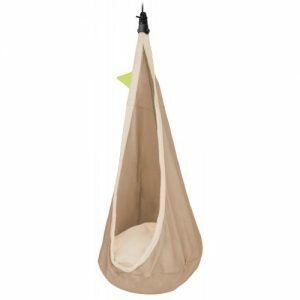 It hangs from the ceiling like a cocoon and comes with a large comfy cushion. It is a perfect place for dreaming, reading or playing. 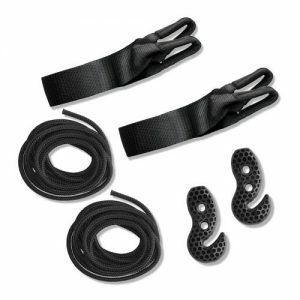 Price includes set of 2 hugger straps. 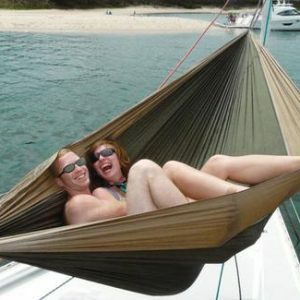 Hang your hammock in seconds. 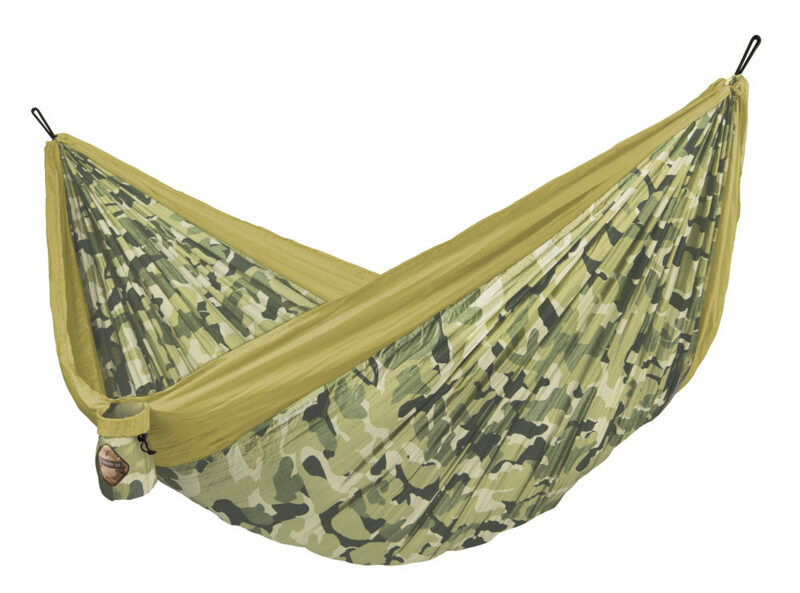 2 hunter green, nylon webbed, cinch straps. 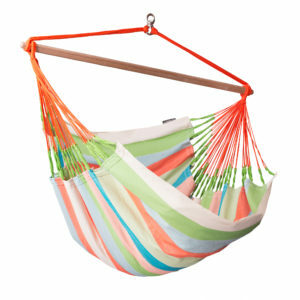 Hammock hanging hardware included. 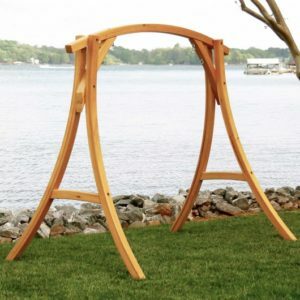 Fits trees up to 3′ in diameter. 800 lb. capacity when used as a set. 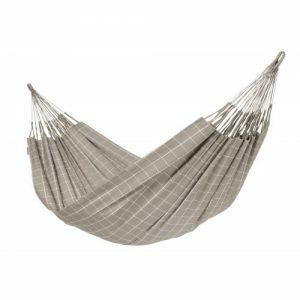 Wonderfully spacious and cozy, for a feeling of weightlessness – hammock chair lounger HABANA nougat, made of organic cotton. 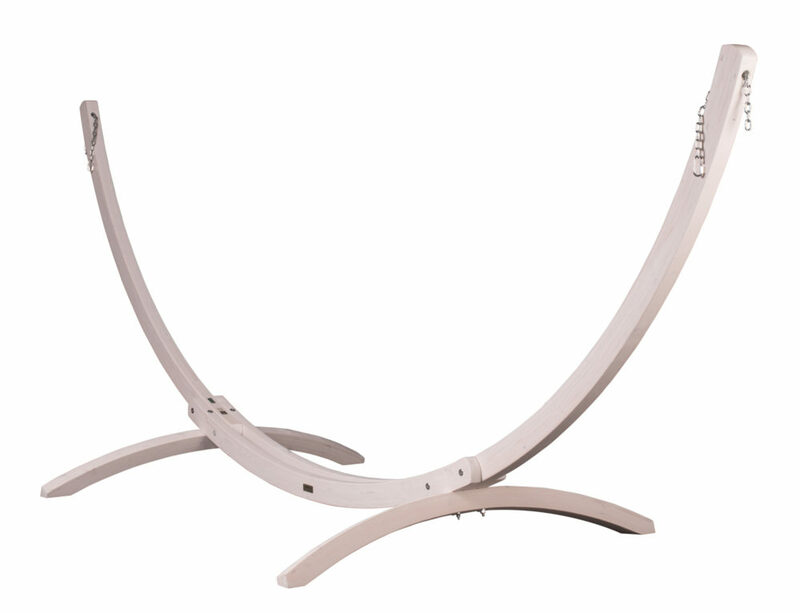 It is extra-large, enabling you to not only sit comfortably, but also recline. 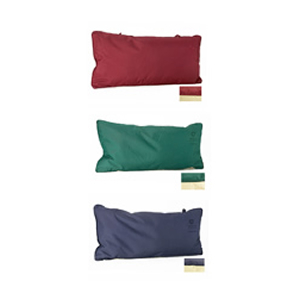 The fabric, made from soft organic cotton, is wonderfully soft to the touch and yet easy to clean. 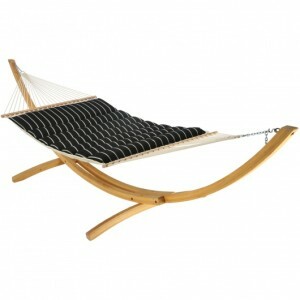 The HABANA lounger is certified by GOTS to be fair to both human and nature. 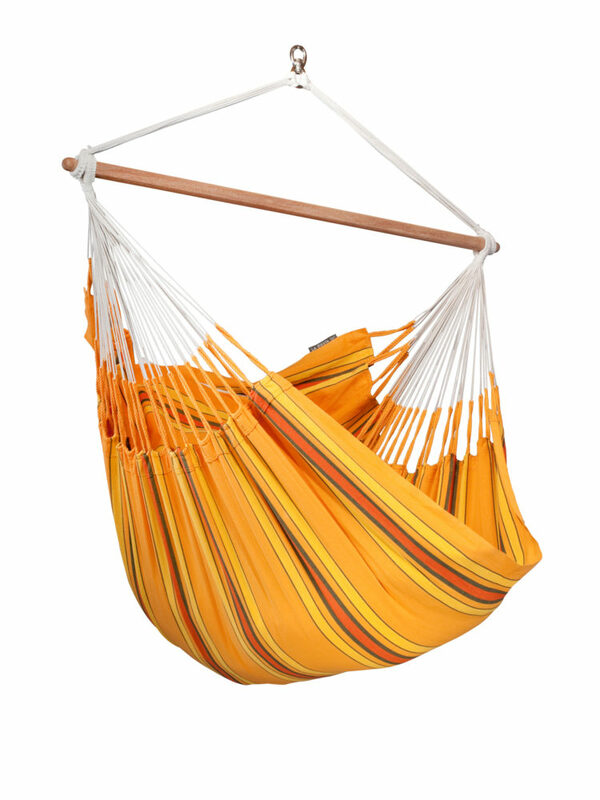 The large number of cords is typical for our Colombian hammock chairs. They ensure optimal weight distribution and incredible comfort, as well as durability. Reinforced edges make the material extremely tear-resistant. 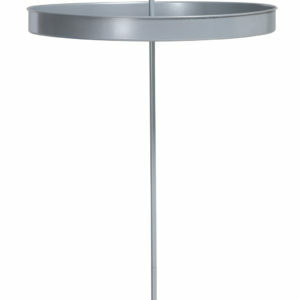 The integrated safety swivel guarantees safe 360° rotation. 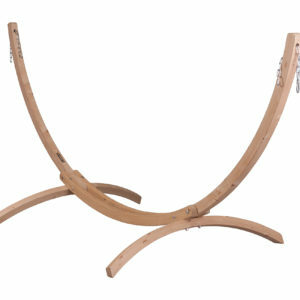 The spreader bar, made of top-grade bamboo, is not only an eye-catcher, it is also extremely sturdy and weatherproof. In addition, the wood comes from responsibly managed forests(FSC ®). 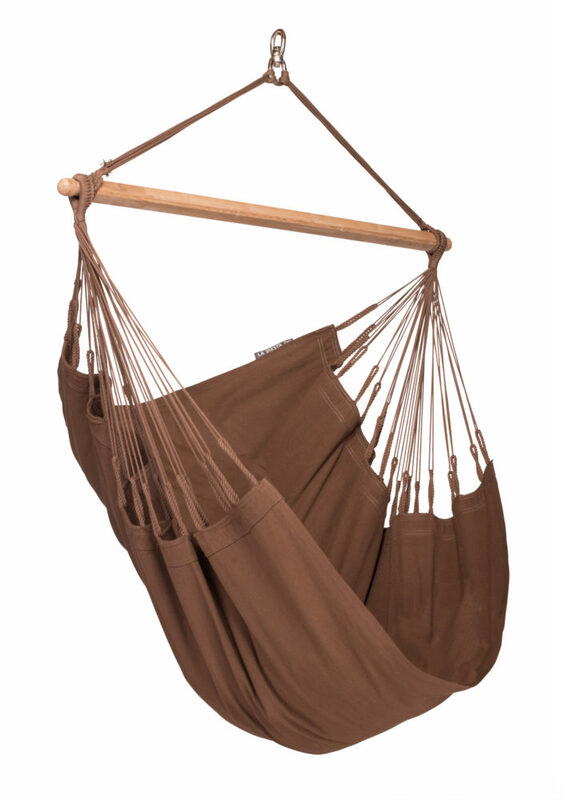 Wonderfully spacious and cozy, for a feeling of weightlessness – hammock chair lounger HABANA chocolate, made of organic cotton. 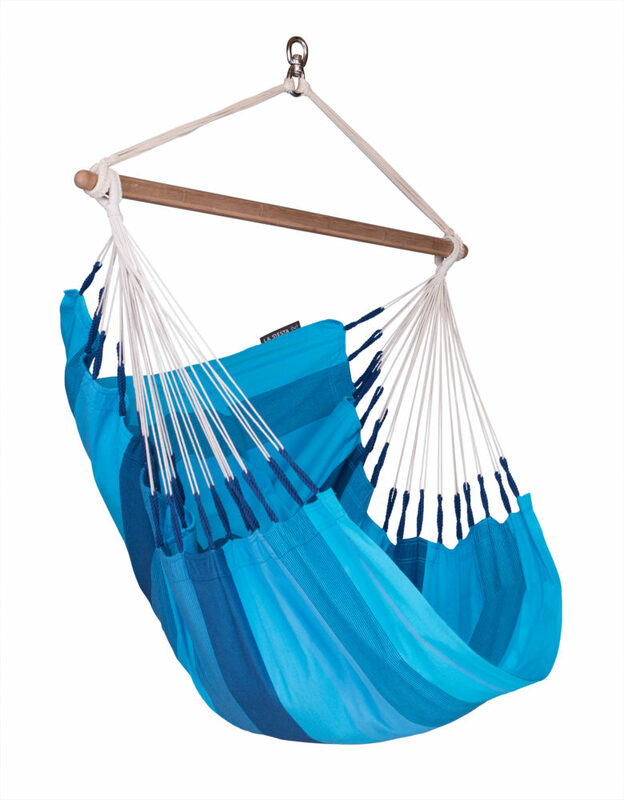 Great addition to your hammock chair or hammock. 250 lb. weight capacity. Stainless steel. 2″ wide x 8″ long. 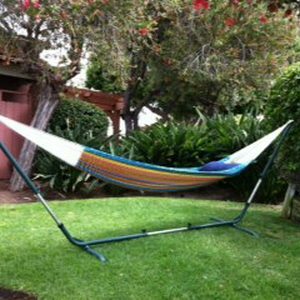 Price is for 1 hammock spring. 500 lb. capacity. Stainless steel (won’t harm trees). 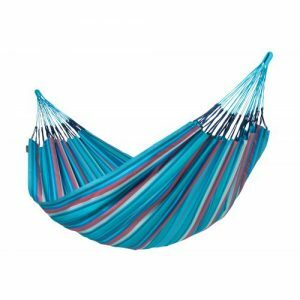 Price is for 1 hammock hook.